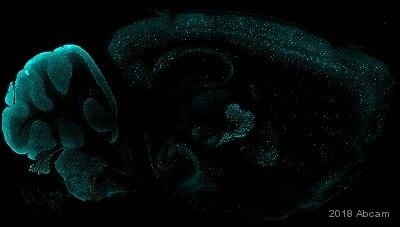 Rabbit polyclonal Parvalbumin antibody. Validated in WB, IP, ELISA, IHC, ICC/IF and tested in Mouse, Rat, Chicken, Human, Sea urchin. Cited in 103 publication(s). Independently reviewed in 25 review(s). Full length native protein (purified) corresponding to Rat Parvalbumin. Purified parvalbumin from rat skeletal muscle. Our Abpromise guarantee covers the use of ab11427 in the following tested applications. WB Use a concentration of 0.1 µg/ml. Detects a band of approximately 12 kDa. Parvalbumin protein is relatively small and, therefore, it is recommended that electrophoresis be performed using tricine-SDS-PAGE gels and transferred to a nylon membrane. Belongs to the parvalbumin family. Labeling with markers for Blue opsin (blue (S-) opsin expressing cones), Green opsin (green (M-) opsin expressing cones), Rhodopsin (Rod cells), Parvalbumin (amacrine cells), Calbindin (horizontal cells), and Brn3a (ganglion cells) did not reveal any problems with cell placement, organization or morphology within the retina when examined at postnatal day 30.5. n = 3. Scale bar = 50 µm. Parvalbumin is detected using ab114427 at 1/200 dilution following fixation with methanol:acetic acid (1:3) and embeding with paraffin. Immunohistochemistry was performed on normal biopsies of deparaffinized Human tonsil tissue. To expose target proteins heat induced antigen retrieval was performed using 10mM sodium citrate (pH6.0) buffer microwaved for 8-15 minutes. Following antigen retrieval tissues were blocked in 3% BSA-PBS for 30 minutes at room temperature. Tissues were then probed at a dilution of 1:100 with a rabbit polyclonal antibody recognizing Parvalbumin ab11427 or without primary antibody (negative control) overnight at 4°C in a humidified chamber. Tissues were washed extensively with PBST and endogenous peroxidase activity was quenched with a peroxidase suppressor. Detection was performed using a biotin-conjugated secondary antibody and SA-HRP followed by colorimetric detection using DAB. Tissues were counterstained with hematoxylin and prepped for mounting. Immunocytochemistry/Immunofluorescence analysis of U251 cells labeling Parvalbumin (green) with ab11427 at 1/200. F-Actin staining with Phalloidin (red) and nuclei with DAPI (blue). Cells were fixed with formaldehyde and incubated with the primary antibody overnight at 4°C. 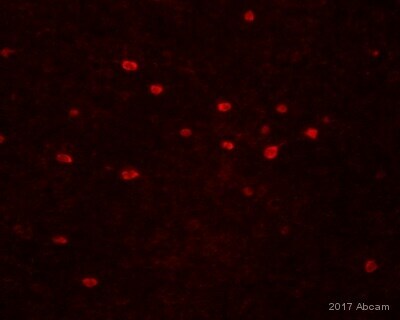 A DyLight 488-conjugated secondary antibody was used. 60X magnification. Right - negative control. Immunocytochemistry/Immunofluorescence analysis of HeLa cells labeling Parvalbumin (green) with ab11427 at 1/100. F-Actin staining with Phalloidin (red) and nuclei with DAPI (blue). Cells were fixed with formaldehyde and incubated with the primary antibody overnight at 4°C. A DyLight 488-conjugated secondary antibody was used. 60X magnification. Right - negative control. Immunocytochemistry/Immunofluorescence analysis of C6 cells labeling Parvalbumin (green) with ab11427 at 1/100. F-Actin staining with Phalloidin (red) and nuclei with DAPI (blue). Cells were fixed with formaldehyde and incubated with the primary antibody overnight at 4°C. A DyLight 488-conjugated secondary antibody was used. 60X magnification. Right - negative control. Immunocytochemistry/ Immunofluorescence - Anti-Parvalbumin antibody (ab11427)Image is courtesy of an AbReview submitted by Ms Babben Tinner. Immunocytochemcial immunofluorescence analysis of 4% PFA & 0.2% Picric acid fixed rat cordical cells in culture, labelling parvalbumin with ab11427 at a dilution of 1/500 incubated for 12 hours at 4°C in 10mM PBS & 0.03% Triton X diluent blend. The secondary was a Donkey anti-Rabbit polyclonal Alexa Fluor® 488 conjugate at 1/200. 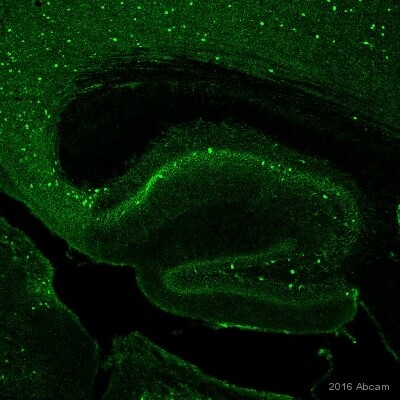 ab11427 staining mouse brain cells by ICC/IF. Cells were PFA fixed and permeabilized with Triton, prior to blocking with 10% serum for 1 hour at RT. The primary antibody was used undiluted and incubated with the sample for 18 hours at 4°C. 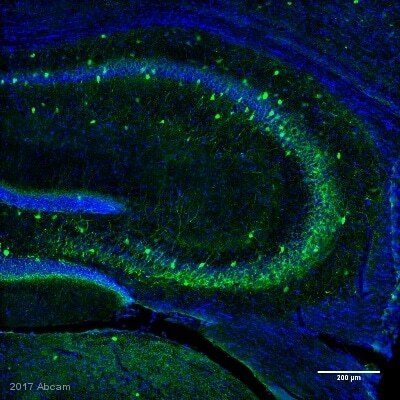 An Alexa Fluor® 488 conjugated goat anti-rabbit antibody was used as the secondary. Immunohistochemistry (Formalin/PFA-fixed paraffin-embedded sections) - Anti-Parvalbumin antibody (ab11427)Image courtesy of an anonymous Abreview. ab11427 staining Parvalbumin in human brain tissue sections by Immunohistochemistry (Formalin/PFA-fixed paraffin-embedded sections). Tissue was fixed in formaldehyde and a heat mediated antigen retrieval step was performed using EDTA pH 8.0 for 20 minutes at 100°C. Samples were then incubated with ab11427 at a 1/1000 dilution for 20 minutes at 25°C. The secondary used was an undiluted HRP conjugated goat anti-mouse/ rabbit IgG. 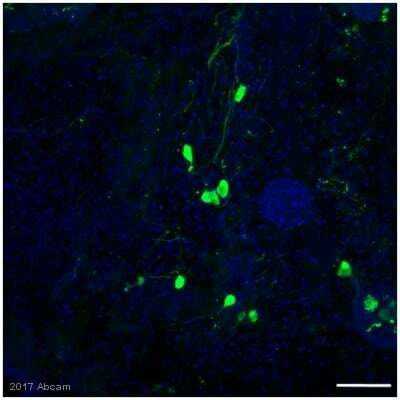 Immunohistochemistry was performed on normal biopsies of deparaffinized Human cerebellum tissue. To expose target proteins heat induced antigen retrieval was performed using 10mM sodium citrate (pH6.0) buffer microwaved for 8-15 minutes. Following antigen retrieval tissues were blocked in 3% BSA-PBS for 30 minutes at room temperature. Tissues were then probed at a dilution of 1:100 with a rabbit polyclonal antibody recognizing Parvalbumin ab114227 or without primary antibody (negative control) overnight at 4°C in a humidified chamber. Tissues were washed extensively with PBST and endogenous peroxidase activity was quenched with a peroxidase suppressor. Detection was performed using a biotin-conjugated secondary antibody and SA-HRP followed by colorimetric detection using DAB. Tissues were counterstained with hematoxylin and prepped for mounting. Immunohistochemistry was performed on normal biopsies of deparaffinized Human skeletal muscle tissue. To expose target proteins heat induced antigen retrieval was performed using 10mM sodium citrate (pH6.0) buffer microwaved for 8-15 minutes. Following antigen retrieval tissues were blocked in 3% BSA-PBS for 30 minutes at room temperature. Tissues were then probed at a dilution of 1:20 with a rabbit polyclonal antibody recognizing Parvalbumin ab11427 or without primary antibody (negative control) overnight at 4°C in a humidified chamber. Tissues were washed extensively with PBST and endogenous peroxidase activity was quenched with a peroxidase suppressor. Detection was performed using a biotin-conjugated secondary antibody and SA-HRP followed by colorimetric detection using DAB. Tissues were counterstained with hematoxylin and prepped for mounting. Publishing research using ab11427? Please let us know so that we can cite the reference in this datasheet.